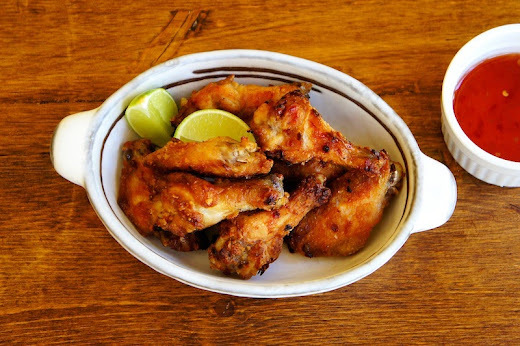 These chicken wings are crispy and flavorful, perfect game-day snacks. In a medium bowl, whisk together the garlic powder, ground coriander, white pepper, sugar, chili flakes, fish sauce, soy sauce, and sea salt. Marinate the chicken wings for about 4 hours, or overnight. When ready to cook: Preheat the oven to 450˚F. Coat the chicken wings with rice flour, making sure that all the nooks and crannies are covered, and shake off any excess flour. Arrange coated chicken wings in a single layer. Bake for about 20 to 25 minutes on each side. Serve warm with some lime wedges and Thai sweet chili sauce, if desired. Thanks for sharing this wonderful recipe. I've never floured my marinated chicken when I baked them, only when I deep fried them. Now, I can do that and still have crispy chicken. Thanks again! Am sure this will a favourite dish for weekend. Thanks!